Municipalities are continually asked to do more with less whether its maintaining municipal buildings, providing a vast array of community services, or providing protection for citizens during emergencies. There is no one “cookie-cutter” generator solution that will meet the incredibly diverse needs of municipalities. The good news is that Generac Industrial Power provides a wide range of gensets, accessories, controllers, and enclosures, so we can help you find the optimum solution to surpass your challenges. With major hurricanes and massive flooding that can occur at any time, the role of emergency preparedness is very great. Citizens not only depend upon crisis services including first responders and 911 call centers, but they also look to municipal facilities for shelter during the storm. Authorities may also need municipal buildings to act as command centers in the wake of a disaster. If that were not enough, FEMA and other governmental agencies are asking cities and towns to deliver more robust support systems to community members living in underserved areas and government-sponsored housing unit. Police and fire stations, and 911 call centers must function during emergencies. 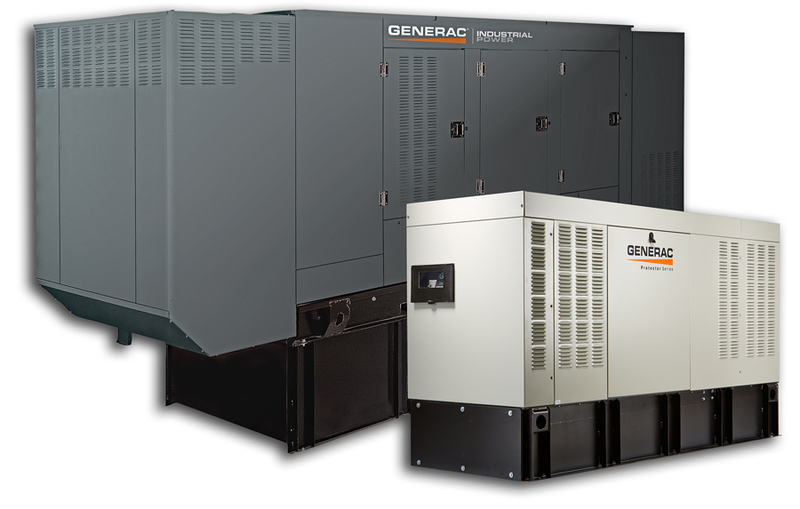 Generac provides diesel gensets from 50 kW up to 2 MW to meet NEC and NFPA requirements for on-site fuel. And many of these gensets can be paralleled to meet even greater power requirements. Generac’s Modular Power Systems (MPS) feature on-generator paralleling so our units do not require dedicated and expensive third-party switchgear. Future expansion generators simply tie directly to the generator bus. Because the paralleling is already built into the generator, the Generac MPS system inherently has greater flexibility for growth, requires less electrical room space, and reduces initial capital cost, which can help with your always tight budgets. Paralleling also works for many government housing units as rooftop installations are being specified so flooding doesn’t impact power supply. MPS gensets are smaller and lighter weight which helps balance the rooftop load, while still providing the needed kWs. For more information on industrial back up power for education, contact South Shore Generator. For more information in industrial generators for municipalities, contact South Shore Generator in Wareham, MA. You provide your customers with a 99.999% uptime guarantee, standard in the industry. Your company may also be supporting multi-tenancy computing, co-location, and facilitating new platforms around cloud computing and virtualization. These platforms have new power requirements. Average power consumption at the rack is going up and more power needs to be available to support growth and backup/emergency power supplies. Continuous duty, onsite power is one of the key factors that is required for data centers to obtain Tier III or Tier IV certification from the Uptime Institute. Continuous power is used for applications where there is no utility power and the generator set is relied upon to supply a constant load for an unlimited number of hours annually such as remote power stations or co-location facilities. 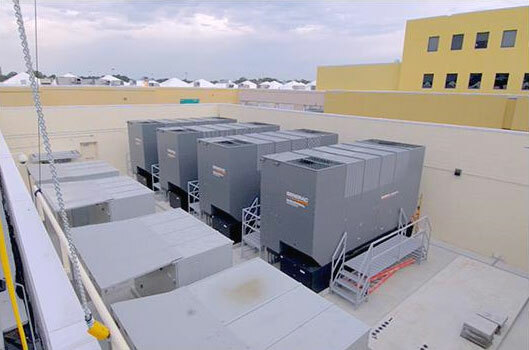 Generac provides a range of solutions that have been used nationwide in Tier Certified facilities. Generac’s proven Modular Power System (MPS) for paralleling generators offers data centers the power, redundancy, scalability, and safety required. One of the key advantages is that you can specify the backup system for the power you need now, not in future. This allows you to spend more of your initial capital on servers and other equipment. And, as you power needs grow, it’s easy to “add on” another generator to meet your growing needs. The MPS approach does not require paralleling controls in dedicated third-party switchgear, so expansion generators can either simply tie directly to the generator bus, or to a breaker on that bus. And the generators do not have to be next to each other on a pad to be paralleled, so you can spread the field and your potential risk. In addition, our MPS allows you to combine fuel options: diesel, natural gas, or even bi-fuel. This not only gives you have the benefits of genset redundancy, you also have fuel redundancy. And natural gas relies on a strong underground pipeline network that is rarely impacted by weather or other crisis events—providing another critical advantage. For more information on back-up power, contact South Shore Generator in Wareham, MA. The Use of Natural Gas Generators, Is Natural Gas or Diesel More Acceptable in MA? Generac Industrial Power recently attended the 2017 NFPA conference in Boston, Mass. to discuss the use of natural gas generators in emergency system applications with the authority having jurisdiction (AHJ) community. Is natural gas acceptable in your area? The first asked if natural gas was an acceptable fuel for emergency system applications in their jurisdiction. Sixty-four percent replied yes; another 25 percent was uncertain. This illustrated a very high acceptance rate that mirrors the explosive growth in natural gas generators documented by Frost and Sullivan – 38 percent of the total North American market revenue is now natural gas generators, which is up from 28 percent only three years prior. Who dictates acceptance? What guidelines exist? Similar processes, which leverage a letter from the local gas utility, are often utilized by the AHJ community when natural gas reliability is perceived as questionable within the market. Another method for determining reliability may leverage the guidance given for determining electric utility reliability in fire pump applications. NFPA 20 A.9.3.2 defines reliable as not having experienced any shutdowns longer than four continuous hours in the year prior to planning. This standard does not require the utility source to be infallible; it only requires a utility source free from routine outages. Using these criteria, most natural gas systems across the United States should be deemed reliable. What is your personal perception of natural gas? The last question focused on each attendee’s personal perception of natural gas reliability. Fifty-five percent of the respondents felt natural gas was favorable to diesel with 38 percent uncertain. This relatively high perception of natural gas reliability is influenced by personal experiences with hurricanes Irene and Sandy, both of which destroyed the long-standing conventional wisdom that diesel fuel delivery was assured even during the most severe emergencies. Both storms caused enough damage to the petroleum supply networks, making refueling requirements a challenge. Hurricane Sandy devastated fuel terminals across the Northeast. Even if a delivery truck was able to get to a terminal, it was unlikely it would be able to obtain fuel. The available fuel and trucks within the region were often redirected by the government to hospitals and targeted emergency response facilities. It is incorrect to conclude that diesel fuel, simply by its on-site presence, is more reliable than natural gas. A reliable fuel supply is one that is consistently available in sufficient quantity and quality to ensure reliable emergency power. It is necessary to holistically examine external factors influencing the relative reliability of natural gas and diesel. The Boston NFPA conference allowed Generac a great opportunity to explore these topics directly with a cross section of the AHJ community. These insights help illustrate that natural gas acceptance continues to grow within markets that have an established natural gas infrastructure. In these markets, the resulting awareness and acceptance of natural gas-fueled emergency generators is quite high.